Get ready to put your money where your maths is with these engaging worksheets that will teach your child the basics of spending, saving, and managing money. 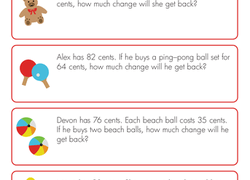 From learning to identify and match coin values to adding and subtracting money in real world word problems, these worksheets are the perfect tool to teach kids the value of money and the maths skills necessary to manage it. Counting up your pocket change is an important life skill! 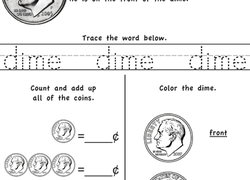 Help your kid with coin addition using this simple worksheet. 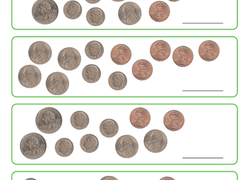 Money worksheets can teach kids so much more than just the value of pennies, nickels, dimes, and quarters. For the youngest learners, money worksheets and manipulatives serve as a wonderful tool to get kids counting, learning basic adding and subtracting concepts, and perhaps most importantly of all, learning about place value which is essential for developing number sense. 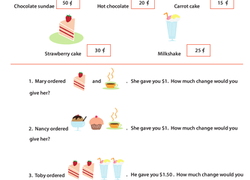 As kids get older, money maths becomes a great way to apply fractions, decimals, and percentages training to real world situations, such as determining sales prices and calculating tax and gratuity at a restaurant. Give your child a solid head start with hundreds of worksheets designed to teach everything from identifying and ordering coins to adding up purchases and calculating change in a variety of pretend scenarios. Bring the fun and learning home by printing out our play money and setting up a grocery store in your kitchen. Or challenge your child–and yourself!—to help you stay on budget when shopping by keeping track of purchases. By teaching kids the value of money and the basics of managing it early on, they’ll be more prepared to manage their own money and finances down the road.